Adelphi, from 1967 to its merger with Noddle's Island Lodge in 1982. Adelphi-Noddles Island Lodge, from its creation in 1982 to its merger into Moses Michael Hays Lodge in 2003. Atlantic Lodge, from 1920 until its merger with Theodore Roosevelt-Manet Lodge in 1987. Gate of the Temple Lodge, from 1964 to its removal to Stoughton in 1981. Manet Lodge, from 1921 to its merger with Theodore Roosevelt Lodge in 1969. 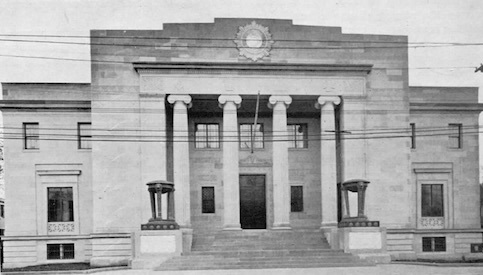 Norfolk Union Lodge, (since unknown date). Quincy Lodge, from 1987 to its merger with Delta Lodge in 1995. Rural Lodge, from 1803 to 1834, and from 1853 to the present. Theodore Roosevelt Lodge, from 1919 to its merger with Manet Lodge in 1979. Theodore Roosevelt-Manet Lodge, from 1979 to its merger with Atlantic Lodge in 1987. Wollaston Lodge, from 1954 to its merger with Rural Lodge in 2004. 11/16/1904: 1904-121; Dedication of Masonic Apartments, at a Special Communication. 10/31/1926: 1926-378; Corner-stone laying, at a Special Communication. 11/04/1927: 1927-272; (Atlantic) Hall dedication, at a Special Communication. 11/21/1927: 1927-276; Hall dedication, at a Special Communication. 10/24/1989: 1989-115; Hall rededication, at a Special Communication. 06/08/2001: 2001-35; Hall rededication, at a Special Communication. The new $375,000 Masonic temple erected by the Quincy Masonic Association at 1100 Hancock street, Quincy, was dedicated Monday night, Nov. 21, by Most Worshipful Frank L. Simpson, Grand Master of Massachusetts, assisted by officers of the Grand Lodge. Mayor Thomas J. McGrath of Quincy was a guest and speaker at the banquet at 6:30 P. M.. which was presided over by Albert E. Sargent, president of the association. The dedicatory ceremony began at 7:15 P. M., when the officers of the Grand lodge was received by Worshipful Master William Cantlay of Rural Lodge. Rural, Theodore Roosevelt and Manet lodges; St. Stephen's Chapter, Royal Arch Masons; Quincy Commandery Knights Templars, and Taleb Grotto, all members of the Quincy Masonic Association, now occupy the building. Quincy Chapter, Order of Eastern Star; Order of Amaranth and the White Shrine will hold their meetings in the temple. Designed by J. Williams Beal Sons, the building, two stories with basement, having a frontage of 107 feet and a depth of 151 feet, is of Greek architecture, with modern interpretations. It is made of Indiana limestone, with a corner-stone of.Quincv granite. The main lodge room, resembling the interior of a Greek temple, with the ceiling designed to represent the cedars of Lebanon, is on the first floor. It contains Grecian benches, with a seating capacity of 000. A banquet hall, accommodating 900 persons and equipped with a full stage, moving picture booth, kitchen and a special dining room, is located in the basement. A large lounge room, billiard parlor and committee rooms are on the second floor. A Skinner organ also is located on this floor. The temple is heated by an oil vacuum steam heater and is lighted by an indirect exterior light. Rural lodge, parent of four other lodges now within the boundary of Quincy, was constituted in 1801, with William P. Whiting as its first worshipful master. Continuing to exist until 1884, it surrendered its charter then on account of anti-Masonic sentiments which existed at that time. It was again constituted in 1853, and now has a membership of 996. There are now 3500 members in the Rural, Wollaston, Theodore Roosevelt, Atlantic and Manet lodges. This page was last modified on 13 October 2015, at 20:44.